This weeks Bloggers Challenge was to create a card using the Autumn Fest layout on page 108 of the Fall/Winter Collection Catalog. You could use any stamps/card stock or ink. Here's what I came up with. Be sure to visit the Bloggers Challenge Blogs listed on the left to see what the other players came up with this week. If you decided to make this challenge card for your blog - be sure to leave a comment with a link to your blog on this post. Look at you in the Christmas spirit already ;-) Great job, love the colors you used! I love these colors, so out of the box. Love it!!! I've been trying to decide which snowflake set I want....think it'll have to be this one....I love this card! Pretty colors for Christmas! Great job, Lisa! 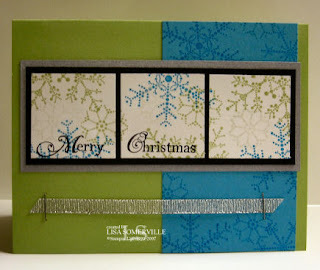 I love this card, love the colors, a nice alternative to the usual Christmas colors. Very creative!!! Lisa, that is just exceptional. I am thinking about CASING this for my Christmas Card! WOW! This card is just so gorgeous. I have looked at it 10 times!! Simply fantastic. This is just beautiful! Love the non-traditional holiday colors. Fun layout.